Wells Gray Riders Association is a local not for profit organization that enjoys community relationships with individuals, businesses and other groups to provide fun local entertainment and events. The WGRA hosts many functions such as “Man Tracker Invitational”, monthly Gymkhanas, Clinics, Youth specific events, etc. Catering to all ages of riders and non riders and mostly family friendly. The WGRA organizes seasonal trail rides for all levels of riders in Clearwater and surrounding area. We happily host a Children’s Wish Ride and Horse and Pedestrian Awareness Walk annually, both for a great cause. 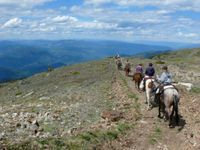 Becoming a member has great benefits such as the opportunity to visit or stay at the old McDougal Cabin on the Clearwater River in the Wells Gray Park, enjoy the use of our well footed riding arena and attend an exciting year end celebration, just to name a few. The WGRA meets every 2nd Wednesday of the month at the Wells Gray Inn Monroe Room. Everyone is welcome and encouraged to come to our meetings and events. Please visit our Facebook page or website for up to date information as well as membership forms. This is an open invitation to all riders of all ages in the community. We are looking forward to wonderful year full of lots of fun activities for all riding disciplines.